CNC and electrical discharge machines (EDM) are sophisticated milling, turning, boring, and grinding machines. Many of these machine use oil-based lubricants, which can overheat, ignite, and cause a flash fire. Our supplemental fire suppression system is designed to extinguish fires inside the CNC machine. Our system will provide fire suppression to protect the operator and the individual machine limiting damage to a small area that external overhead code-mandated sprinkler systems cannot, helping to limit damage during a fire event. Early detection and rapid fire suppression in the CNC machine will detect and extinguish the fire before it can spreads outside of the machine. The cost of a fire suppression system is minimal relative to the investment of today’s sophisticated CNC machines and certainly more economical than repairing major damage and downtime caused by a fire. 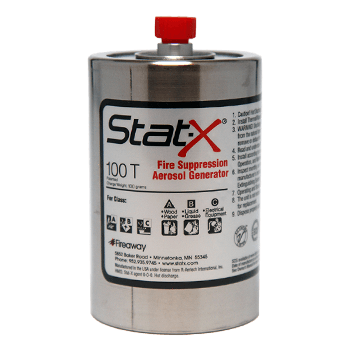 In the event of a fire, Stat-X units automatically release ultra-fine particles and propellant inert gases which quickly and effectively extinguish fires without depleting oxygen levels and with no negative impact on the environment. The 24/7 automatic system is an option to be considered for unmanned machines. The Stat-X unit is designed to extinguish the fire in seconds. After a ten-minute wait, the aerosol can be immediately vented. Stat-X suppression solutions leave little residue which aids in getting the machine returned to operation quickly. Hundreds of CNC machines throughout the world are being protected by Stat-X units. It’s time you consider these for your machines! Retrofitting into CNC machines is fast, simple, and requires minimum installation time. Stat-X® units are available either as electrically activated units which are typically integrated with a fire detection system, or as manually-activated units, with a cable-pull action. They are available in various sizes and device selection are based on the size of the enclosure. Typical CNC and machine tool installations include a single Stat-X aerosol generator installed with a linear heat fire detection system, an interface with the machine’s emergency shutdown system, and a release control panel. The simplicity of this system results in an extremely robust and versatile fire suppression system for the machine shop owner. Manually operated units are optional alternatives to electrically operated units and provide stand-alone fire suppression without the need for an electrical power source. The unit is of similar design and construction to the electrically operated units except that the actuation method requires human intervention by means of cable pull action.